San Francisco officially the City and County of San Francisco, is the cultural, commercial, and financial center of Northern California. San Francisco is the 13th most populous city in the United States, and the 4th most populous in California, with 884,363 residents as of 2017. It covers an area of about 46.89 square miles (121.4 km2), mostly at the north end of the San Francisco Peninsula in the San Francisco Bay Area, making it the second most densely populated large US city, and the fifth most densely populated U.S. county, behind only four of the five New York City boroughs. San Francisco is also part of the fifth most populous primary statistical area in the United States, the San Jose–San Francisco–Oakland, CA Combined Statistical Area (8.8 million residents). As of 2016, it was the 7th highest-income county in the United States, with a per capita personal income of $110,418. The San Francisco CSA was the country's 3rd largest urban economy as of 2017, with a GDP of $878 billion. Of the 574 primary statistical areas in the US, the San Francisco CSA had the highest GDP per capita in 2017, at $99,347 per capita. San Francisco is ranked 8th in the world and 2nd in the United States on the Global Financial Centres Index as of 2018. 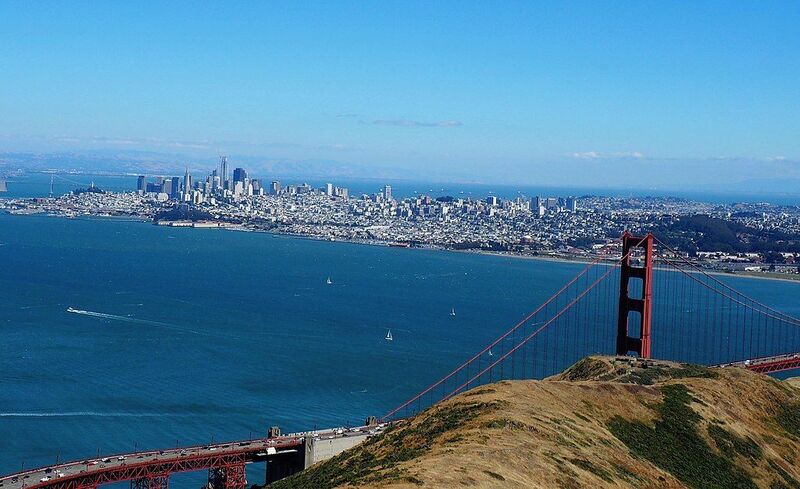 San Francisco was founded on June 29, 1776, when colonists from Spain established Presidio of San Francisco at the Golden Gate and Mission San Francisco de Asís a few miles away, all named for St. Francis of Assisi. The California Gold Rush of 1849 brought rapid growth, making it the largest city on the West Coast at the time. San Francisco became a consolidated city-county in 1856. San Francisco's status as the West Coast's largest city peaked between 1870 and 1900, when around 25% of California's population resided in the city. After three-quarters of the city was destroyed by the 1906 earthquake and fire, San Francisco was quickly rebuilt, hosting the Panama-Pacific International Exposition nine years later. In World War II, San Francisco was a major port of embarkation for service members shipping out to the Pacific Theater. It then became the birthplace of the United Nations in 1945. After the war, the confluence of returning servicemen, significant immigration, liberalizing attitudes, along with the rise of the "hippie" counterculture, the Sexual Revolution, the Peace Movement growing from opposition to United States involvement in the Vietnam War, and other factors led to the Summer of Love and the gay rightsmovement, cementing San Francisco as a center of liberal activism in the United States. Politically, the city votes strongly along liberal Democratic Party lines. As of 2017, San Francisco is the highest rated American city on world liveability rankings.